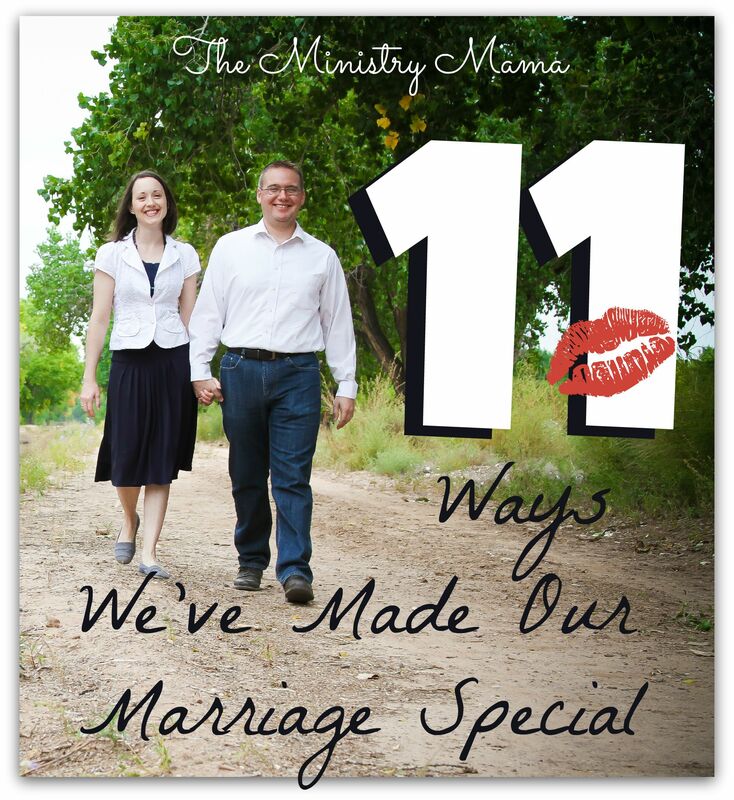 In celebration of our eleventh anniversary I want to share eleven ways we have tried to make our marriage special through the years. 1. Our anniversary date is 9-11 so usually when we see the time is 9:11 am or pm then we will say to each other “Happy Anniversary.” This lets us know that we’re thinking of something only we share. 2. We have given our children a routine bedtime. Once things get settled down 15-20 minutes after we make the kids go to bed then we usually share our one-on-one time together for at least a couple of hours. 3. We eat late night snacks together…it’s our weakness. It’s true, one of our children (it’s a conspiracy) is always peeking or coming up with an excuse after they go to bed to see what we’re going to be eating together. While we chow down we are talking and discussing life in our adult after-kids-go-to-bed-life. 4. We follow our favorite marriage advice from my husband’s grandparents who have been married for over 50 years to “do everything together.” Okay, so maybe not EVERYTHING, but we try to do a lot together, making dinner, going on errands, and etc. My husband is very good at participating in our family even though he is tired and I think that it helps our marriage tremendously. 5. We like to play games together. Yahtzee is our latest addiction, among other games like Battleship, Checkers, Ticket to Ride, other card games and even two-player games on the tablet. 6. We bought a book about romance. One year we went to Barnes & Noble and bought a really big book of romantic ideas. It has helped us tremendously when we have needed a quick idea to get our creative juices going in our everyday love life (being sweet to each other all the time) as much as our intimate love life. 7. One of my favorite things we have done as a couple to keep ourselves dating each other is that we printed off the Passport to Love year of dates from The Dating Divas. In the passport you pick countries you want to “visit.” When you choose a country like Mexico you will eat Mexican food, listen to mariachi music, and come up with a fun or other romantic idea to go with that country’s theme. We each took six of the dates and locations and had the responsibility to come up with the ideas for that country. It made it fun, sometimes we dressed up and had a fun home date and other times we scheduled activities on a night out. *Note: You may not be able to visit this website if you have a strong internet filter but you could still take the idea and come up with your own passport and share the date destinations around the world for a year. 8. Before we were married we passed a small wooden red heart back and forth between each other. We would leave it on the dashboard of each other’s car, in a love note, or in a surprising place. We still pass that little heart around when we find it. Recently while we’ve packed to move we found it again and it gets keeps getting passed or put in a place for the other person to find. It’s just a fun way to think all the way back to the beginning of our relationship and continue what has become a small and meaningful tradition. 9. Going out on dates has been a treat when we are able to do it. When someone we trust offers to watch the kids and let us have some alone time then you know we are going to take it! Whether it’s for a trip to the grocery store when my in-laws are in town or going out for dinner when a lady or family in our church has volunteered to be a blessing we do it! Sometimes going out just isn’t possible, that’s why we really emphasize the one-on-one time after the kids go to bed. 10. Showing affection in front of our kids. Often my husband says out loud to our children, “Who wants to see Papa give Mama a big kiss?” The general roar of the mini crowd says “I do!” and we proceed to lip-lock in a fairly conservative way. Then, we smile at each other and applause and laughter breaks out before the next “Again, again!” We will usually indulge the kids a few rounds before they want to be close to us and give us hugs too. We hold hands, kiss, and hug regularly in public to give our children the security of knowing their parents really do love each other. 11. Helping each other with our responsibilities whether it is work/ministry related and/or home related. This was partly mentioned earlier but we blend our lives by stepping up at times to meet the needs of the other person in our daily life. I am a planner and organizer and many times my husband has been able to execute special ministry jobs better when I have been able to help him sit down and think through the planning. On the other hand, I don’t know how many times I’ve told my husband, “I don’t know why God calls me the helpmeet when you help me so much.” Putting each other first and seeing the needs of the other person can really magnetize you together if you do it in the right spirit and attitude. We’re not perfect people and we’re certainly not the best example of marriage out there, but these are the things we have enjoyed doing together to keep our marriage special. I would encourage you if you have been married for any length of time to make a list like this, it really makes you think and it creates an endearing moment of sweetness when you realize all the love that has been passed between you through the years. It’s a blessing to say the least! You can read about what I’ve learned from 10 years of marriage, the article that I wrote this time last year.